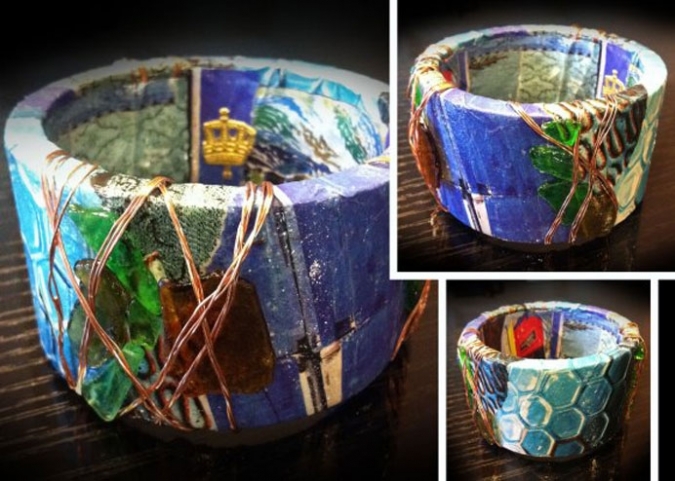 EE cuffs was founded last year by good friends, Veronica Gadea and Leila Moazzez, with the goal of creating unique handmade jewelry from recycled and repurposed materials such as magazines, glass, fabric, petals, leaves and seashells. What originally started as a hobby and an outlet to express their creativity, has now become a successful business for these two friends. EE cuffs is proud to be be a "green company" and be able to contribute with the environment by creating something beautiful for everyone to wear. "We create wearable art," says Founder and Co-Designer, Veronica Gadea. "It is just amazing how much paper is wasted everyday in the mail we get at home. From the newspapers they throw on our front porch to the catalogs we end up tossing in the trash when we are done reading. We've always been self conscious about recycling, but some of these things are really out of our control and at the end of the day most of these papers end up in the trash. It was important to us to do something about it and continue to be eco-friendly." says Veronica. "We find inspiration everywhere," says Co-Designer, Leila Moazzez. "From sea glass on a recent trip to the beach, to the leftover wire on our husbands' toolbox. We are surrounded by materials that can be recycled and repurposed and with a little bit of creativity you can make something beautiful and original from something that initially looked ordinary... Like they say 'Someone's trash is someone else's treasure'." 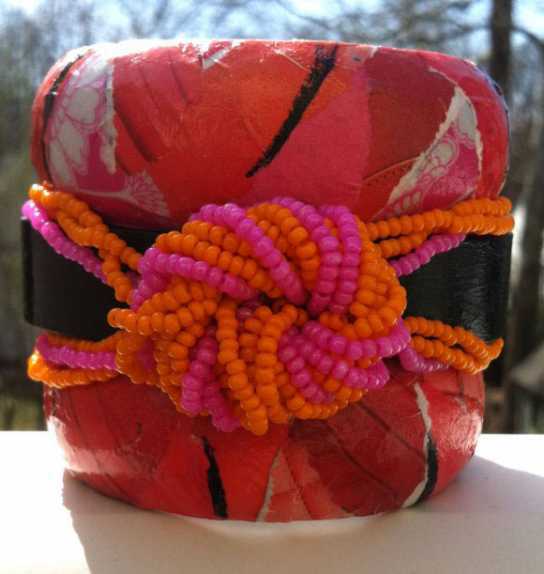 These cuffs are all about vibrant colors and statement designs so these pieces will inject some on-trend pizzazz into even the dullest casual ensemble. Uniquely designed to satisfy anyone from a sophisticated socialite to a free-spirited rocker or the bohemian chic. Great to wear at the office or at a-night-out in town. "One question that we've been ask a lot is, 'how long does it take for you to make a cuff'? ", say friends, Leila and Veronica. "It's hard to say. We like to think that our cuffs are wearable art. As they say "you can't rush art." We put a lot of effort and creativity into each individual piece, sometimes 2 hours, sometimes a day. It is important to make sure the flow is right. We basically come up with a vision. From then we lay the materials out and see what goes with what. Every cuff has a theme and a name for the extra flare." EE cuffs likes to stay with today's fashion trends . From bold colors, to tribal influences. It is important for these two friends to not only create something beautiful but also to be able to stay up-to-date with the fashion world. After all that's what fashion is, is creating and wearing a beautiful piece of art. So if being fashionable while being eco-friendly is important to you or if you just like fashionable cuffs then be sure to check out EE cuffs.